Oblique are Sonja (vocals & lyrics), Gonzalez (synth & programming) and Linn (bass & synth), a Spanish synthpop band who have remixed artists such as Northern Kind and Parralox. Their track “All We Want” features on this year’s best synthpop compilation album (Electronically Yours Vol. 1) and their excellent new album “Without Making Noise” has just been released. Without Making Noise opens with “Girl In Black,” a solid synthpop track of the kind Depeche Mode used to make. From the off, Oblique show their unconventional approach: this track features electric guitars in the mix, as if The Human League’s Nick Burke had stepped in to lend a hand. Second track “My Medicine” has a deep ‘n’ dirty intro and a vibe that reminds me of Ladytron and the Parralox song “Black Jeans.” Check out the neat animated video for this from director Oscar Rajah. “Over” is a track you’ll either love or hate: it steers into powernoise territory and shows Oblique’s leanings towards EBM and futurepop. Personally I love how Oblique aren’t afraid to mix multiple styles, but this is the one track you might end up skipping over. The darker sound continues with the excellent “When the Guitar Fell In Love With My Synth,” a song that develops from the EBM sound of Front 242 and Nitzer Ebb into some funked-up electro and synthpop for Client fans. “Synthetic Brightness” is another stand-out track that brings the tempo down. The composition shines out and I love the string and piano breaks in this ballad. “The Boy From The Stars” has a sweeping Yazoo feel to it and sounds ripe for an EMP remix. Oblique have saved the best till last though: “Sincerely Yours” is a Dear John farewell to lost loves that starts with a deep EBM sound but soon develops into pure synthpop. It’s a brilliant closing track that makes me want to listen to the whole album again. Without Making Noise is a fantastic synthpop album with touches of futurepop, EBM, and 80s electro. 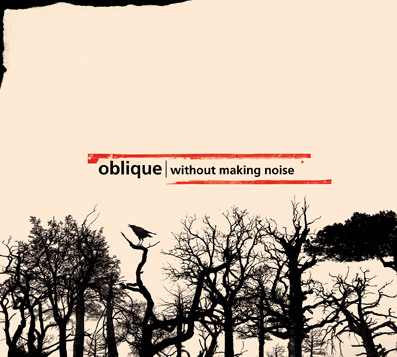 This year has seen some of the best synthpop in decades, and Oblique’s new album is another great addition.